Thought we’d throw up a trip report from our outing the other day. 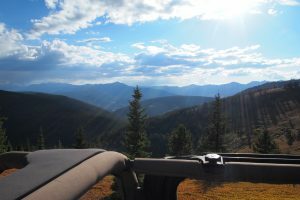 It was a gorgeous afternoon solo trip from Red Cliff, up McAllister Gulch, over Ptarmigan Pass, and back into “civilization” at Camp Hale. Phew, what a mouthful! All in all a great trip with some gorgeous vistas and foliage as the leaves here in Colorado have just begun to change. 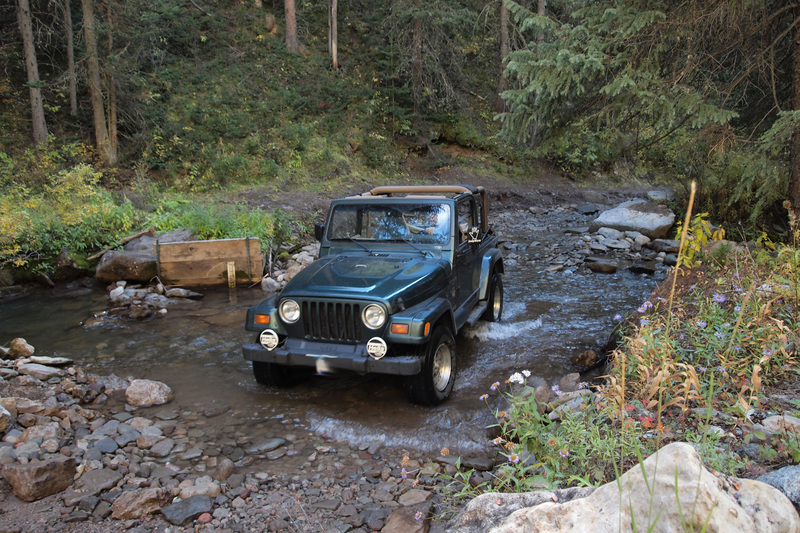 To start, we were counting the Jeep Wave’s over to the trail head via Rte. 24 in Minturn / Red Cliff. We initiated about 10 and got 9 back. Not a bad rate of return at all, especially based on the feedback we’ve been getting on the Facebook Page lately. 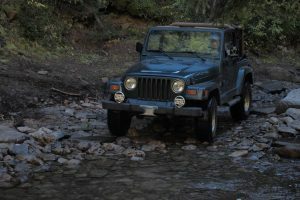 Heading up towards Shrine Pass, we hadn’t been on McAllister in a long time, so we were curious if it remained as difficult for our near stock Wrangler as it had been last time. 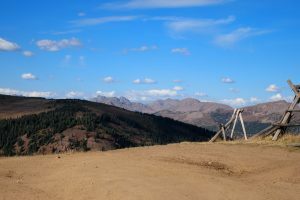 Any one who is familiar with the trail knows that the time of year is the make or break for this run. Since early summer runs on this trail are often impossible due to rushing rapids, we were fortunate to hit it at this point in the season. 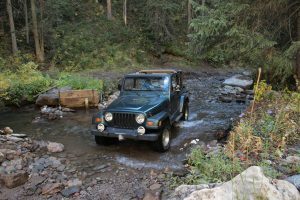 The gentle flow of the late September cascades were a piece of cake and the multiple creek crossings were done with ease. 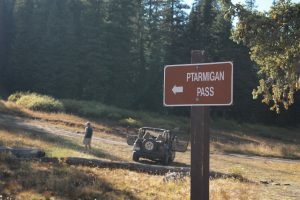 Over the river and through the woods, we opted to continue up towards Ptarmigan pass (left at the fork) as we had heard the McAllister Gulch loop to Camp Hale was potentially closed for the year for repairs. Not having been this route before, we didn’t know what to expect. Up we went and encountered a few steep rocky sections. 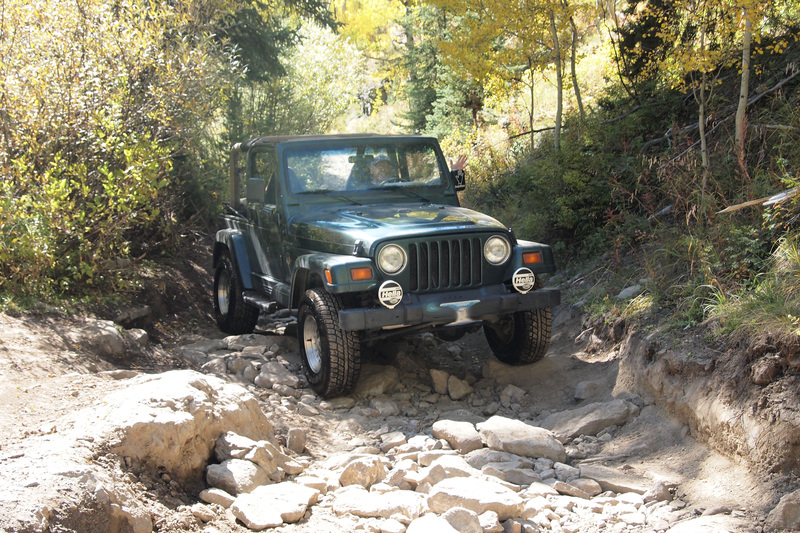 Big rocks with careful tire placement allowed us to get past without too much trouble. Keep in mind we’re working with just a 2in. lift. 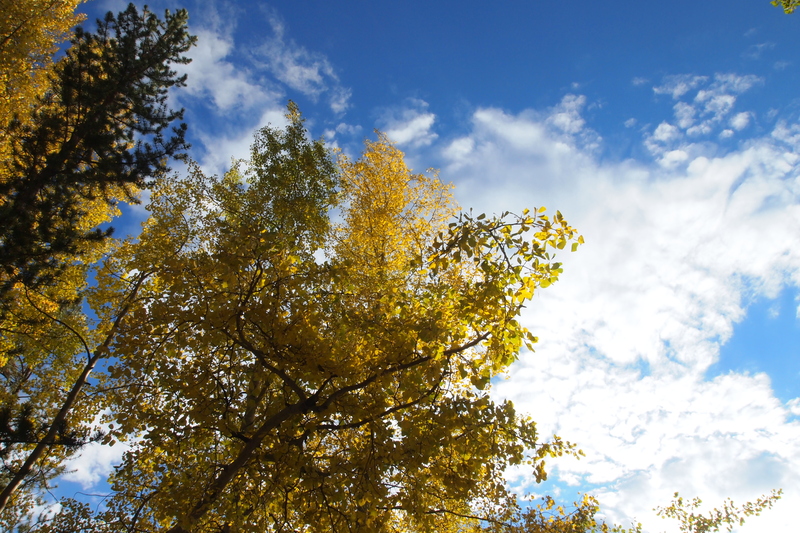 A few bruised kidneys and about 20 minutes later, the road returned to mostly dirt, winding up the hillside with golden aspens dropping leaves on our path. Rounding a few big corners, we approached Ptarmigan Pass. The rolling terrain up here was impressive and got this skier thinking about snowier days and seemingly endless powder runs. Now, to outfit the Jeep with tank treads for the winter! Back to reality, we took in the views and thought about heading back down to Camp Hale as the clouds moving in spelled rain and looming darkness encouraged us to head home. The road down was probably do-able in a Chevy Caprice which was just fine after being jostled on the boulders earlier on. Ready for some food, we headed back to Minturn, CO and grabbed some BBQ at Kirby Cosmo’s. All in all, a great outing and nice way to spend a gorgeous Fall day in Colorado. There’s probably only a few more weeks left until the snow blankets us up here in the mountains…so go out and get some! 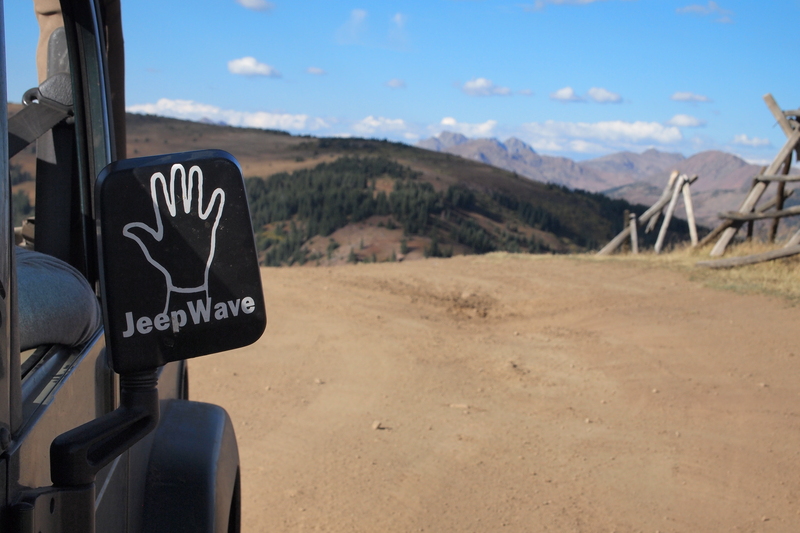 Oh, and don’t forget to Jeep Wave! 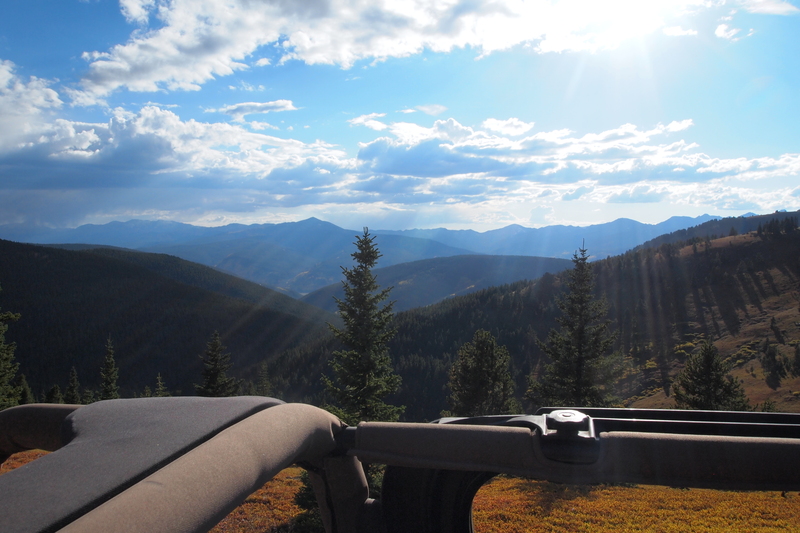 – May is the fifth month of the year and you often do the Jeep Wave with 5 fingers…so that’s how we start. 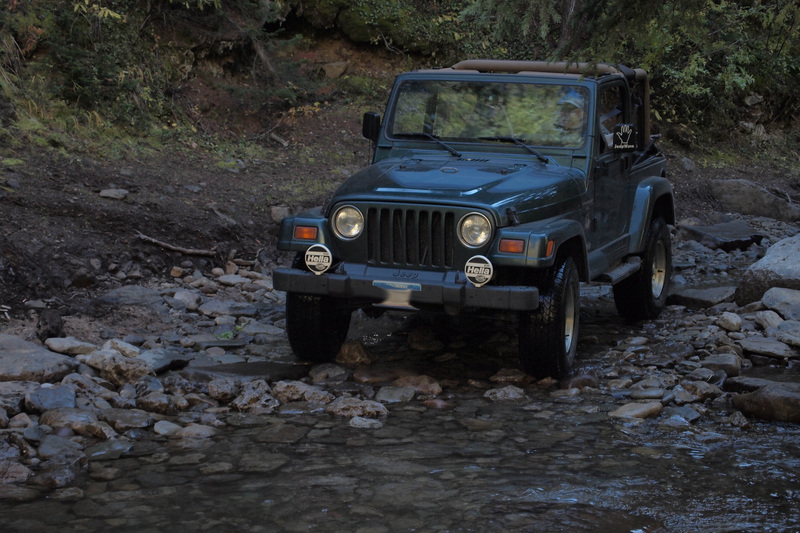 – The 7th day of May pays homage to the seven slot grille that defines the Jeep brand. 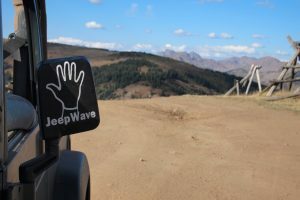 – So long as the world doesn’t end in 2012, we’ll have our first national Jeep Wave day on May 7th, 2012 to honor thy Jeep and recognize the drivers who share the love. Hopefully you can help spread the word. Tell your friends. Share the news on facebook and twitter. Help us pass out fliers as the time approaches. Dealerships need to know about this too so it can be a success. Thanks and keep on waving.